BOOKTRYST: One Novel, Two First Editions. Different Book. Huh? One Novel, Two First Editions. Different Book. Huh? In 2009, writer Marc Schuster had his first novel published. The Singular Exploits of Wonder Mom & Party Girl, issued by PS Books in Philadelphia, is a horrifying and painfully funny first-person narrative slice of a modern American woman’s life overwhelmed by the siren's song of American consumer culture and its kindly cruel emancipation proclamation that women can have it all. 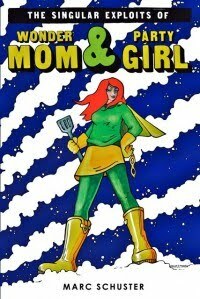 In 2011, Permanent Press will issue the first edition of The Singular Exploits of Wonder Mom & Party Girl. Same novel, same author, same title. Different book. The circumstances required a note to the author. Schuster and Martin Shepard, co-publisher of Permanent Press, began to correspond. Schuster sent Shepard a copy of ...Wonder Mom. “After he read it,” Schuster continued, “he asked if it was available. Fortunately, my relationship with PS Books was such that they were willing to let me out of my contract fairly amicably, so I was able to give my novel a second life through Permanent Press. First revised edition, June 2011. Martin Shepard and his wife and co-publisher, Judith, had a few suggestions for improving the book and asked Schuster to make revisions before officially accepting it for publication. That was in August of 2009. In the first first edition, the “lift” referred to is provided by cocaine. In the second first edition, the referenced package contains a gift book sent to our recently divorced heroine, Audrey, from her mother. It’s a copy of Singular Pleasures: The Womanly Art of Masturbation. By either entrance, you’ve stepped onto a roller-coaster of satire and tragedy, middle-class yearning and middle-class angst, the demands of motherhood versus the desires of womanhood, and the consequences when we try to be all things to all people and wind up being nothing to nobody. Open door number one, and you are thrust into a hard, edgy landscape that may alienate some potential readers, Wonder Mom well into her Party Girl persona, a half-gram of cocaine in her wallet. Open door number two and Wonder Mom greets us as an apple pie on the verge of being sliced up and served on a darkly tarnished silver platter. The alternative angles of attack can be fairly characterized as assault versus seduction, a slap v. firm caress. Afterward, what we are left with is a case-study in the novel-writing process, the importance of a publisher/editor who can wisely and gently guide a writer to their manuscript’s best potential, and a novelist not afraid to re-imagine his work to possibly reach a broader readership without sacrificing his key themes, the protagonist’s core character, and the dark awakening from a suburban nightmare that morphs into a malignant waking dream. One edition of the novel drops us directly into the chaos that has become Wonder Mom’s life, the other follows her toward the looming tumult. Both challenge the reader. I can’t decide which I prefer. You may wish to own both first editions. One book, two first editions. 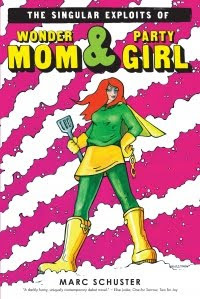 That would never happen if The Singular Exploits of Wonder Mom & Party Girl had been originally published by a large, mainstream publisher. We have here a sterling example of how small press publishing can do something that the majors can no longer do - if they ever could: Give a first-time novelist a chance - and then a second chance with their first novel. SCHUSTER, Marc. The Singular Exploits of Wonder Mom & Party Girl. Philadelphia: PS Publishing, 2009. First edition. 293 pp. SCHUSTER, Marc. The Singular Exploits of Wonder Mom & Party Girl. Sag Harbor, NY: Permanent Press, 2011. First (revised) edition. 279 pp. So happy for you!!! A second life for your awesome book - maybe I will be the one directing the movie after I adapt it for the screen!! So amazing that you almost took the Endicott job - it is gorgeous on that campus - some great days of my life and eager students!! so glad you liked the interview.